When speaking to the press about the Terrorist Attack in the Jerusalem Synagogue, Prime Minister Netanyahu condemned the continuous anti-Israel and anti-Semitic incitement by the supposedly moderate Palestinian Authority and Fatah Party run by President Abbas. Especially over the past few weeks, Abbas and his party have been calling for violence against Israelis and Jews. Abbas condemned the attack. But it is not enough. Later on, the continuation of that sentence after he condemned the murder today, he connected it to all sorts of imaginary events that ostensibly Israel performed in Temple Mount which did not take place. There's daily incitement every single hour and they turn those murderers into heroes, into cultural heroes. But there is ongoing incitement against the very existence of the state of Israel, against the security of the citizens of Israel, constantly through the schools, in the media, in the mosques. And this is the root of the conflict. This refusal to recognize and to educate the new generation to the existence of the state of Israel. For example broadcast on the official PA TV Station November 7, Fatah official Muhammad Al-Biqa'i sent blessings of "praise and esteem" to recent terrorists Al-Shaloudi , Mutaz and Ibrahim Al-Akari, then honored the murderers for heeding the call that "Jerusalem needs blood to purify itself of Jews"
On the official Palestinian Authority TV channel on 9/26 Mamoud Al-Habbash, advisor to Palestinian President Abbas on religious and Islamic Affairs, preached that all of the land from the Jordan River to the Mediterranean Sea is Palestinian, in other words the entire country of Israel is illegitimate. 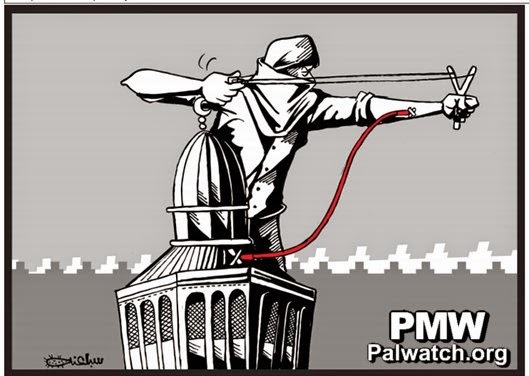 The official newspaper of President Abbas' ruling Palestinian Authority, Al-Hayat Al-Jadida, has been running cartoons trying to incite violence against Israeli Jews using the fake story that Israel is planning to destroy the Al-Aqsa Mosque and other Muslim holy sites. This cartoon ran on November 1. It shows a man standing on top of the Dome of the Rock shooting with a slingshot while giving blood to the Dome. In a telegram delivered yesterday [Nov. 2, 2014] by Minister of Jerusalem Affairs and District Governor Adnan Husseini to the Martyr’s relatives in the village of Silwan, he [Abbas] said that Martyr Mutaz rose to Heaven while defending our people’s rights and holy places. In addition, he condemned this barbaric act, which is added to the occupation’s crimes against our people since the Nakba (i.e., ‘the catastrophe’ Palestinian term for the establishment of the State of Israel), as well as the continuation of the historic injustice being committed against it wherever it is present. It is incredible what political simpletons Jews are. They shut their eyes to one of the most elementary rules of life, that you must not "meet halfway" those who do not want to meet you.